Bake My Day! 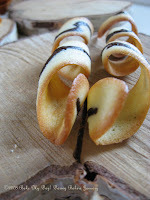 : Hosting Daring Baker's Challenge: Tuiles! Hosting Daring Baker's Challenge: Tuiles! This is my test batch of the first recipe, used them as a decoration for our Christmas dessert. It's a chocolate-vanilla cake filled with white chocolate pear mousse. Do you ever have voices in your head? Care to listen to mine? I was to host January's Daring Bakers Challenge assisted by sweet Zorra (aka Kochtopf) as co-host. This is an abbreviated version of what was going on in my head mid December. You're doing what? No way, this is too easy! People will have all the ingredients in their cupboard! - but that's a good thing isn't it? Oh you don't think so. Credit crunch? 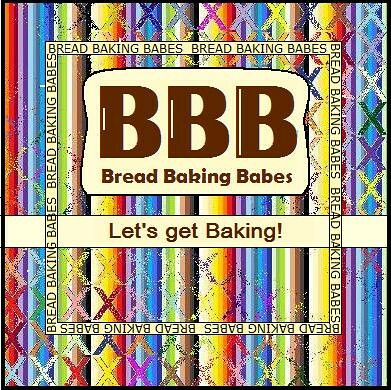 Listen to me now: it's a Daring Baker's Challenge. This is going to take them what? 1 hour? - yes. yes. I know. It's January, they'll be glad after cooking month December. Harumph! and what exactly are they supposed to do with it? Oh crafty huh? Ánd creative. With what exactly? - the technique isn't as simple as you might think and I'll ask for creativity in the pairing. Miss Smarty pants..You've covered it all. So one last question: you're a bread person. Zorra is a bread person. Where's the bread? Eeeh.. not here. not this time. And yes we cried, a little. We wanted to..decided not to. Please, voice in my head, would you please shut up and let me finish my challenge post? Thank you. - pair it with something light; fruit, sorbet, a mousse, or maybe even a fruit soup, think glazes or dips…..
Bend it, shape it, anyway you want it! 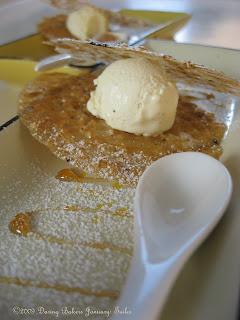 These are my Sesame Vanilla oysters: using toasted white sesame seeds instead of almonds paired with home-made vanilla ice cream. I came back in the kitchen after making these pics (happily munching) to find my carefully scooped melon and kiwiballs.... forgot to plate them! Or, cut out and using your fingers or a knife, push in to folds or pleats… use as a basket, twirl round a knitting needle.. Temper the couverture, and stir in the toasted almonds. Place the template on a sheet of rodoïde (or use a clean sheet of sturdy plastic such as a folder) and fill with about 1 tbs of the mixture. Repeat the process a little distance away from the first one. As soon as you have 5 tuiles fit, slide them onto a mold or rolling pin (side of a glass) to curve. Let cool completely, lift tuiles off the plastic only after the chocolate has set and just before serving, so that they keep their shine. There should not be any holes in the batter. Lift the stencil and repeat the process to make as many rounds as you have molds or to fill the Silpat, leaving about 1 1/2 inches between the cornets. Sprinkle each cornet with a pinch of black sesame seeds. Place the Silpat on a heavy baking sheet and bake for 4 to 6 minutes, or until the batter is set and you see it rippling from the heat. The cornets may have browned in some areas, but they will not be evenly browned at this point. Fold the bottom of the cornet and around the mold; it should remainon the sheet pan as you roll. Leave the cornet wrapped around the mold and continue to roll the cornets around molds; as you proceed, arrange the rolled cornets, seams side down, on the sheet pan so they lean against each other, to prevent from rolling. ** I’ve used 1 teaspoon fine table salt in my test-batch, and depending on what you plan to fill them with I would use less; start with ½ teaspoon. In the Netherlands I’ve never seen kosher salt but I understand it’s a coarser grind hence the substitute difference. *** My oven door opens...as a door! So I placed the baking sheet on a counter that sits above the radiator (central heating thing) and that worked fine. You really need that extra heat because these babies need it to get a good shape. You could maybe slide out yr ovenrack and work on that too. The savoury ones are a keeper as well, they're the perfect appetizer or amuse-bouche. I still have to make the chocolate ones, and I have another savoury one up my sleeve, posting tomorrow! I'd like to thank my co-host Zorra (aka Kochtopf) for her participation this month and her willingness to do tuiles over bread. Thanks Zorra! You can find her post over at 1x umrühren bitte. 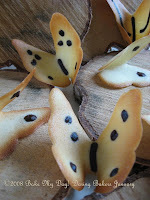 I've seen wonderful creations over at our Daring Baker Forum, truly a creative, imaginative bunch of bakers. Thanks for baking with us! Thanks for the great challenge! Mine didn't turn out as beautiful and tasty looking as yours but I had a great time! YES!! Heb ik eindelijk hét recept voor de authentieke 'Vegter's Rolletjes'. En zomaar in mijn schoot geworpen gekregen door eenvoudige deelname aan de Daring Bakers Challenge van januari. Géén botercrème. Géén ingewikkelde taartenbakkerij (helaas ook géén interessante nieuwe broodtechniek), maar wél een fantástisch leuk nieuw koekje gemaakt. Súperuitdaging. 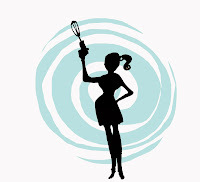 Thank you for sharing your talent and sharing your recipes. You see! This is why you're ALWAYS supposed to listen to the voices in your head. Thank you so much for hosting, Karen and for giving us such an interesting challenge. Beautifully done! The cake wrapped in a tuile at the top of the post is absolutely stunning! And white chocolate pear mousse - I need me some of that ... Thanks to you and Zorra for hsting this challenge - I was too scared to try making tuiles on my own. This was one fantastic challenge; I absolutely loved it! Even though I was hoping you'd pick bread :P All yours look delicious! Absolutely fabulous. Gorgeous pick & I'm hooked to your post. This was one really versatile challenge; wish I could have done more. Your post is inspirational! Thank you for being a such a wonderful host with Zorra! Have a good day! Thank you for hosting this months challenge. I love the sesame ones and the duck breast filled coronets the best. Evryhting looks wondeful. Karen you are simply stunning and flawless! I'm really in awe! This was/is an awesome and incredibly versatile challenge. And yes they are not hard at all. Although so far I have nothing to show. I'll be baking tomorrow. Thank you so much Karen for picking such a challenge for us this month! WOW! Everything you made looks so great... 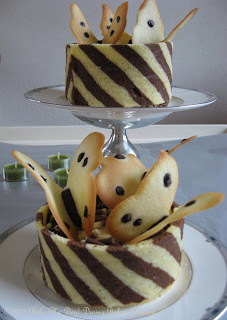 I especially like the long swirls, how creative! This was a very enjoyable challenge and not time consuming at all ! You really impressed me with this challenge. I am sorry I could not make it more beautiful. I have been to sick this month. I will try them again soon. I love all the versions you made! The polka dotty butterflies and the twirlies are my favorites. The sesame vanilla oysters sound divine, though. Thanks for picking such a great challenge for us this month. I really enjoyed working on my technique with these--you're right, just learning how to spread the batter was a creative endeavor in itself! Thanks for hosting! I thought these were a lot of fun, and I thought it was good to have a more laidback challenge after a busy December. Thank you Karen, for an interesting and unusual challenge and being a great host too. Seriously, though, it was a real learning experience. I have to say it again, your tuiles are impressive! Thanks for this great challenge I enjoyed myself thoroughly. I now will always have pretty little crispy additions to my desserts/starters! I had a great time with the challenge even though I was expecting to make bread this month. :) Thanks so much Karen! Thank you so much for the fun challenge. I was so glad that you and Zorra chose tuiles. Yours, of course look so beautiful especially those butterflies. Your creations are fantastic and ever so beautiful! I love that cake with the pretty butterflies! Karen, thank you SO much for the wonderful challenge! This is certainly near the top of my list of favorite Daring Bakers Challenges. I loved the creativity and how we had to learn a "skill" and not just follow instructions before throwing something in an oven! Thank u for hosting this month's challenge and picking such an usual recipe. Love the whole thing and I must say your creations are really very pretty. What an awesome challenge! Thanks! Love all your creations! Thanks so much for hosting Karen! These were great to make - such a lot of fun and even better to eat! Thanks so much for this great challenge! It was so much fun. That said, your tuiles look fantastic! Great challenge and what a fabulous job you did!! Thank you Karen for a wonderful challenge, I had a lot of fun (and obviously I wasn't the only one: you asked for creativity and you were granted: DBers rock! Those are simply stunning, so beautiful! And yes,we did need something light for January, with a few less steps. Good choice! They are beautiful and the short time for making gave us more play time. Well chosen challenge. Thanks for hosting this month! It was something that I have always wanted to make, but probably would have never! Thanks so much for hosting! 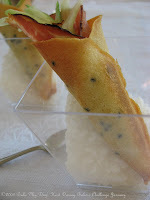 I love the curly q ones and wow a savory tuile with duck breast? Yum yum! Thank you for a great challenge. It was a lot of fun. I wish I could have done fifty more. They will definitely be a part of my baking repertoire. I enjoyed this challenge so much! Thank you! Your tuiles look divine! Thanks for the wonderful challenge! I had so much fun with this! Great challenge that really did allow for a lot of freedom. I do hope to do it again when the weather might cooperate a bit more. Thank you so much for hosting a great challenge! I really enjoyed it. Your Tuiles look amazing. I love the glimpse into your thought process and yes, it was a perfect challenge! Thanks for hosting and I am drooling over all of your tuiles. Oh, your butterfly cakes are so beautiful! What creativity you have! I also love your fresh savory tuile cone. Thank you for the recipes and for hosting such a fun challenge!! Beautiful and so tempting, but I'm a bit daunted by the experience. Kudos to you for a job well done! I love what you did with the tuiles. Thanks for hosting this fun challenge! I love your butterflies! Thank you for hosting this challenge! I've been wanting to make tuiles forever...I just needed the push! Thanks for the great challenge! I love the idea of using nigella seeds. They have a great flavor. LOVED this challenge! Thank you fo hosting. Thanks for hosting the challenge! Your tuiles are beautiful. Such a fabulous challenge and I adore your butterflies. Thanks for a great January DB! Thank you for such a great challenge! Like you, I've always wanted to make tuiles and never quite had the nerve or made the time for it! That's why I love the daring bakers! Puts me in the position to make all these heavenly tid-bites! =) I love your presentation---makes me want to make a new batch! the duck breast and cucumber sounds divine! Just look at all of those incredible, beautiful combinations! You are such an awesome hostess. Thank you, thank you for choosing this awesome challenge. The genius is in its simplicity and versatility. I am so impressed with everyone's challenge(s) and this really pumped the creativity in the group. You are awesome! Thank you for hosting! I didnt do so well...but there's always a next time. :-) I want to try again...my batter came out very, very thick and I still can't figure out why. Stopped in to say hi! These look great! Thanks for the challenge. Love the butterflies. wow, you put so much effort in! your tuile look amazing! Thank you for a terrific challenge--which clearly you have mastered. 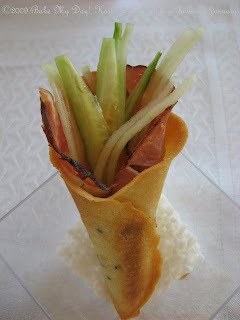 I will be making tuiles again and again--and I love your duck/cucumber savory concoction. Thanks for providing a reasonably-priced challenge this month. Thanks so much for hosting this challenge! your tuiles are breathtaking! The savory ones are making my mouth water!! Thank you for this challenge, yes the ingredients were in the pantry, yes it took 1 hour to bake, but what a joy after Christmas time. I'm glad you didn't listen to those voices, your challenge was perfect in every way! I love that you went all out on this challenge. Awesome job.... everything looks tres delish! Thank you for a great challenge! It was fun and now, I can't wait to make them again. Would love to get mine to look like that first picture of yours! Lovely! hee hee, i love how you outsmarted that voice in your head! thanks for the challenge - i did find it challenging! Thank you thank you for doing this for our challenge! I was desperate for something short and sweet and well-worth it! And you did an amazing job with yours! Inspiring! I'm surprised you aren't tuiled out!! Thanks for picking this recipe. Beautiful! Thank you so much for having such an accessible recipe that still taught me something new about baking. I have to convert everything to gluten-free and this worked beautifully for me. It was fun, on top of it. Thank youuuu! What a beautiful job you've done of this! Just gorgeous. I will say that this recipe will get tucked away because it is versatile and easy. Not too often you can say that, right? Thanks for choosing this recipe -- I've always wondered about these cute little things! You're very talented - your tuiles are absolutely stunning and clearly you've done this at least once before :). What a fabulous presentation. The voice in your head was wrong...thsi was an excellent Daring Baker challenge. Some of us (well, me) didn't succeed, but I've enjoyed seeing all of the creativity of all the beautiful versions the Daring Bakers have made. Thanks! When I first saw the recipe I thought this is too simple!!! and what can I learn from this. In fact this was the most enjoyable of all my challenges and in fact I learnt the most. For some reason I'm a tuile person I really had fun doing all the different shapes. And I learnt so much about baking "cookies" from this challenge. Your photos and tuiles look so fab and cool. Excellent choice. Thank you for hosting,Karen! And congrats on becoming an aunt! Thnaks for choosing a challenge where a lot of creativity was possible. Ik ben, net als mijn 85 voorgangers, zeer onder de indruk: petje af! I love your blog and your baking. I think this was an awesome choice for a challenge. So many creative variations! You really let the Daring Bakers go wild! Ciao ! Thank you for hosting and for choosing such a nice challenge ! I'll have to try the other recipes. I love all thr ones you made !Auguri for the new baby ! Wow your tuils are so beautiful, thanks for thie challenge I learnt a lot. Thanks a lot for this Challenge. Love the stream-of-consciousness part of your post. Thanks for hosting the challenge! It's something I probably wouldn't have made on my own. I have to try your sesame seed crips. Loved the challenge, and I think most DB-ers did. Your butterflies and cake look just perfect! So bummed that I couldn't make it for the deadline. Still working on a post but it won't be for a while. Thanks for the great challenge! These look almost too good to eat. Key word being ALMOST! I have loved all of the recipes I have tried from your blog and can't wait to try this one. Wow, these recipes are awesome, the cookies look gorgeous. Thanks for sharing this lovely recipes to us. I'm going to try this during the Christmas holidays. @Jane: they might look intimidating to make but trust me it's easier than you think! Happy Holidays!